There are around 1.5 million people in the UK with a learning disability and 700,000 with autism. Photographer Polly Braden has spent two years working with just a few who are supported by MacIntyre *, a charity that provides more than 1500 children and adults with learning, support and care. Her photographs look at the everyday moments, achievements and milestones. The subject is complex but the aim is simple: to highlight everyday interactions and life-changing experiences. These are stories about the barriers faced in life, but they are also inspiring, often filled with moments of achievement in things which once seemed difficult if not impossible – from finding employment or using public transport to gaining a measure of independence, graduating from high school or getting married. 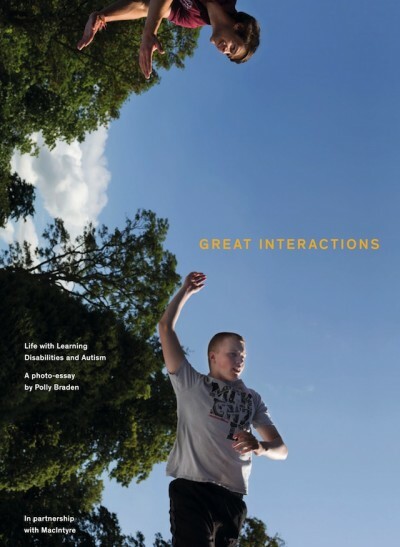 Great Interactions looks to engage decision-makers and the wider public to ensure that people with a learning disability receive the same opportunities as anyone else. In these intimate photos, Polly Braden captures the inner lives of people with differences and disabilities. She sees their dignity and their sometime pathos; their humor and their disappointment; their optimism and their ability to love. Above all, she documents their intense individuality, and makes you see each one as an independent being. This is not a portrait of disability, but a series of portraits of people with disabilities. It is achieved with clarity, respect, and wit. Renowned for her photographs of intimate communication between people, and of gestures that hint at something without explaining it, Polly Braden explores the relationship between everyday life, work, leisure and economics. Her book China Between was published by Dewi Lewis in 2010 and her work has appeared in many other publications. A previous winner of both the Jerwood Photography Prize and The Guardian Young Photographer of the Year award, Braden has exhibited internationally. * MacIntyre is a leading national charity providing learning, support, education and care to over 1500 children, young people and adults with learning disabilities, complex needs and autism, and their families across England and Wales. In 2016 it celebrates its 50th anniversary.